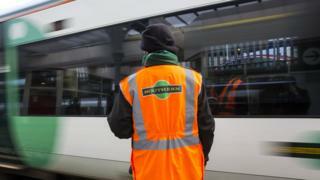 A long-awaited report into the troubled Southern rail franchise has blamed the unions for widespread disruption - but the RMT and Aslef have slammed it as "an attack on staff". The government said the independent report clearly blamed union action and sick leave for disruption. The DFT had said the paper could not be published before the election but has now made it public. It was written by Chris Gibb, a non-executive director at Network Rail. Last week the RMT union demanded it should be released immediately. Both unions have been in dispute with Southern's parent company, Govia Thameslink (GTR), for more than a year in a row over guards' roles on trains. RMT general secretary, Mick Cash, said: "No wonder the government have sat on the Gibb report for seven months. It's taken them that long to slice and fillet it into a document that they can spin up as an attack on the unions and the staff." Aslef general secretary, Mick Whelan, noted Mr Gibb said no single party was responsible and added: "He's right. It's a combination of the Department for Transport (DFT) and GTR/Southern deliberately provoking an industrial dispute." A DFT spokesman said: "The report makes absolutely clear that passengers would have had reliable services had staff come to work as normal - despite the other challenges faced by the network." He said recommendations included spending £300m to improve infrastructure resilience and establishing a new board to tackle problems ahead of "huge" Thameslink upgrades in 2018. So how does Chris Gibb propose fixing matters? Some of his recommendations have already been carried out - remember, the government has had a copy of this since late 2016. So, it chose to spend £300m on Thameslink upgrades before 2018 to avoid scrapping the programme. It chose to reduce overnight services on the Brighton mainline to make room for engineering work. But other recommendations remain. They include closing the line between Horsham and Three Bridges for a fortnight to upgrade the track, phasing out older trains, spinning off parts of the network to Transport for London, using simpler and more sensible ways of rostering staff, and fewer trains through underused stations like Newhaven Harbour. But what about stripping Govia Thameslink of the franchise? Gibb says this may be counterproductive and would probably lead to work on the Thameslink programme pausing. The report described Southern as "running at absolute capacity at peak times and undergoing a period of dramatic and traumatic change" from 2015 to 2018, including revised working practices, new trains and major infrastructure enhancements. In addressing how the system got to this point, Mr Gibb wrote: "I do not believe any single party to have been the cause." He also said some elements of the system had been considered "as an afterthought", including train maintenance depots and stations such as London Victoria. He added: "At the time of writing this, the RMT and Aslef leadership, supported currently by their members, are the primary cause for the system integrity to fail. "Whatever their motives, which are debatable, I do not support their action." Mr Gibb made more than 30 recommendations, concluding Southern's performance "can and will improve", as these were implemented. GTR chief executive, Charles Horton, said it was a thorough review of the UK's most congested railway and the only way to address capacity problems was to modernise infrastructure, trains, systems and working practices. He said: "We urge our trade unions to play their part by working with us on the modernisation of working practices and have assured them that there will be no job losses." He added some recommendations had already been implemented and performance was improving.